So, how do you deal with a breakout when you’re over the age of 18? The first thing you don’t do is go back to the products you used to use when it was fashionable to wear white slouchy socks over black tights. These are made specially for young skin which contains a lot of grease – you need extra powerful ingredients in your teenage years, but your delicate older skin just can’t handle this anymore. All you’d get is dry, dull skin and probably smell of TCP. The most important thing to do is the age-old answer of cleanse, tone and moisturise. Face wipes are fab and all and perfect for when you stumble through the door at 3am and can’t be bothered to take off your slap, but they really shouldn’t be used every day as they’ll leave you with little dry patches (because of the strong chemicals used) and won’t actually get rid of the stuff you can’t see. These should be resigned to festivals and drunken days only. Get yourself a good cleanser and toner that isn’t full of fragrance and artificial chemicals that will only aggrevate your skin further… you don’t need to spend a lot of money so something like Simple, Garnier or L’Oreal is fine. Make sure you’re using these every night to really get rid of the gunk in your skin – you’ll be amazed how much dirt and grime actually comes off… ewww! You should also be using an oil-free moisturiser before you go to bed, and if you can the morning too. 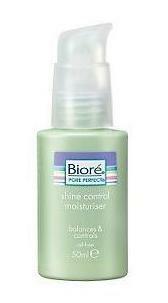 I’ve been using Biore Shine Control Moisturiser which comes in a cute pump-action pot. This is light enough not to clog up your pores, oil free so you won’t look greasy, smells fab and can be worn under make-up easily. It’s easy not to moisturise if you feel spotty, but you shouldn’t be neglecting other areas of your face – you just have to be careful with the type of cream. 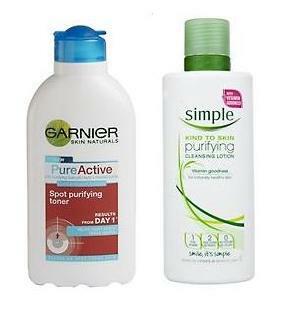 I’ve been trying Garnier’s Pure Active Roll On as something to directly hit my spots with. It’s really pleasant to apply as you get an instant cooling sensation, plus it doesn’t completely dry out the surrounding areas like some tea tree sticks do. It helps to reduce the swelling and I really do think it’s improving the appearance of my ugly red bumps. Tea tree is said to be great for spots, but I fully believe if you’re over the age of 18 it’s jut too harsh… I’ve ended up with a massive dry area which looks worse than the spot did! 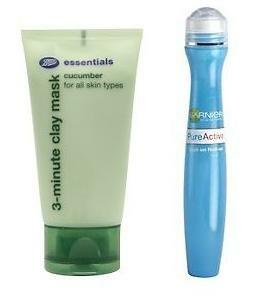 Another top tip is to make sure you use a clay-based face mask at least once a week. Many face masks claim to do everything but clean your dishes, but most of these are just marketing claims rather than scientific ones. Stay away from Montagne Jeunesse – the pretty packs you see everywhere! These are fine if you’re using a mask just for a bit of fun or pampering, but they have hardly any beneficial ingredients so all they’re going to do is tighten your skin temporarily. Clay-based masks are the way to go as the clay ingredient will actually draw out impurities and leave you with extra spangly skin pronto. When I put one of these on my mate this weekend she was amazed at how much her spot practically disappeared after 3 minutes! My fave at the moment is a Boots own brand Cucumber 3-minute Clay Mask – cheap, smells and feels fresh, plus it really does the job. With these tips you should be back to your fresh-faced normality pronto!